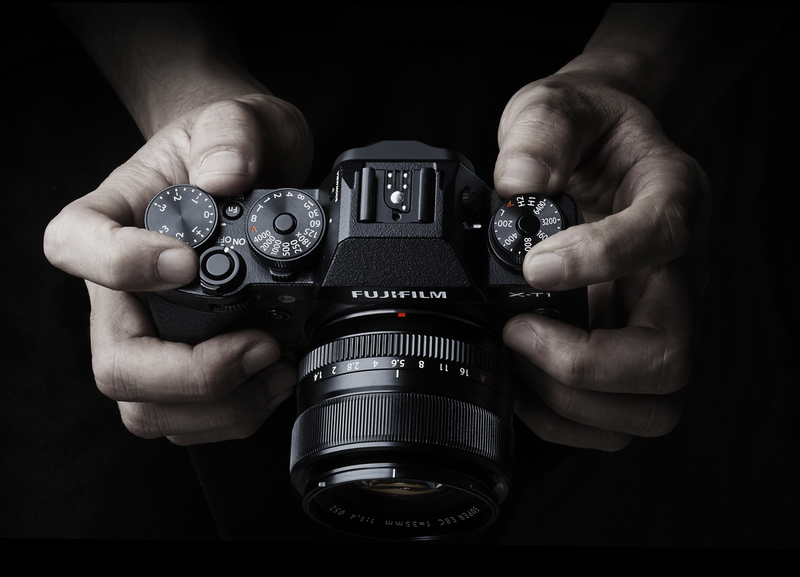 The Fujifilm X-T1 officially arrived today, in much the same manner that Olympus’ OM-D E-M5 arrived back in 2012 – amid a lot of careful leaks stoking wild speculation on the enthusiast gear sites. Looks like Fuji stole a page from Olympus’ marketing playbook. The one photo of the X-T1 that caught my eye was the one above. The camera is cradled in a pair of human hands. In an instant you gain an understanding of the camera’s overall size and placement of the controls. The camera isn’t “retro” by any stretch. It’s classic in the type of controls it provides on the top deck as well as their overall placement. If anything, that view of the X-T1 is more Olympus OM film body-like than Olympus’ own OM-D series. Especially that big, wide faux pentaprism hump. This is the type of camera that Nikon should have made when they made their Df. The X-T1 has a clean, chiseled look like the OM-D E-M1. Not a single extraneous line or stamping anywhere. 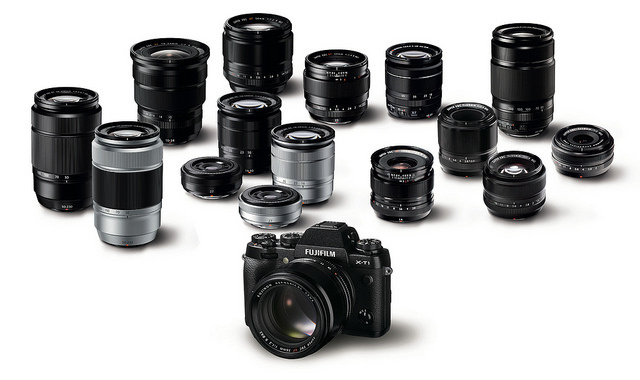 The Fujifilm X-T1 harkens back to classic times when primes were the rule, not overly expensive zooms. Just grab two or three primes (28mm, 50mm, and 85mm equivalents) and a body with a half dozen 36 exposure rolls and you’re off to experience the world. And I most certainly like the breadth of the X lens series. Speaking of controls, one of my favorite features (so far) of the X-T1 are its dials: shutter speed and ISO on top, and with the right lenses, aperture on the lens barrel where it belongs. Want to go all auto on any setting? Simple. Just spin the dial to the ‘A’ setting (for automatic) and the camera just does it for you. That’s what film cameras had going back to the mid 1970s. I know this to be true because my Minolta XE-7 and XD-11 had this capability. And they weren’t the only ones. Having a PASM dial on today’s digital cameras is an acknowledgement by the camera makers that once upon a time photographers used a simpler way to tune automation on their cameras. As for all the other superfluous features on a camera, such as scene modes or art filters, I can do without. One other superfluous feature I can do without is the top deck LCD. We have those on other cameras because we need visual feedback on how the camera is configured. With analogue dials you don’t need a top deck LCD. And if you reclaim that expensive real estate, you can afford to make your dials big and fat and a joy to handle, with easy to read numbers. It won’t be here until sometime in February. When it does arrive it’ll come with a kit lens that’s a cut above every other kit lens of its type out there: an 18-55mm f/2.8-4 zoom lens. A kit lens that’s a half stop to a full stop faster. Olympus and Panasonic equivalents (14-42mm) are f/3.5-5.6, and even the APS-C equivalents in those focal lengths aren’t as fast. Fujifilm understands that what photographer’s want (at least this photographer) is the fastest possible lenses we can reasonably afford. The only lens that comes even close to the Fujifilm 18-55mm is the Olympus FourThirds HG 12-60mm f/2.8-4 zoom. I loved that one lens and miss it still. I doubt the person or persons who stole it really appreciate what they got out of my car. I’m at a cross roads of sorts in my photographic life. At $1,300, body only, this is an expensive camera. I’m thinking I’ll get one more camera before I give it all up and “retire.” But the cost puts it right in the competitive thick of it, against Olympus (E-M1), Pentax (K3), Samsung (NX-300), Canon (70D), and Nikon (D7100). I’ve held them all and have enough test shots to know that they’re all equivalent. Ergonomics are pretty much a non-issue with me. The real bargain in that group is the Samsung at around half the price of all the rest. Quality body, quality lenses, and surprising features. I didn’t include the Samsung Galaxy NX because I’ve held it and can’t stand it. The Samsung NX30 is something of a dark horse that may be another competitor in that group, one that I would consider. And Sony I don’t consider because they’re all over the place with ergonomics and a paucity of native lenses for their E-mount cameras, both APS-C and 135mm. I’m not rushing out to place a pre-order. I’m content with what I have. I’ll continue to use it until such time as the cameras all break or someone comes out with something truly revolutionary and reasonably affordable. My E-M5 is my “big gun” camera, while all my other µFourThird cameras are my artistic, carry around cameras. I’m set and don’t need to buy anything else for the time being. I finally found time this evening to pick up a few items and bring one of my two Raspberry Pi Model B boards to life. My wife and I went out for a simple supper. While we were out I stopped by a local Best Buy and picked up an inexpensive all-plastic 22″ Samsung 1920 x 1080 LCD display and an Apple USB keyboard. The Samsung comes with a convenient HDMI port, which the Raspberry Pi plugs into with the right cable. The Apple keyboard was surprisingly inexpensive as well, the cheapest on Best Buy’s shelves, yet it’s built around a nice machined aluminum frame. I’d already set up the boot device, a SanDisk 8GB SDHC, with last year’s Raspbian release. When I booted up into the graphical desktop I was pleasantly surprised that the Logitech M305 wireless mouse worked with the system. Power was supplied by my Galaxy S4 charger. The whole time I was running the system the charger never got warm. I tried to bring up wireless networking with a USB WiFi Cisco Valet dongle that’s normally plugged into the back of my Wii, but that didn’t work. I need to dig around and see if I can find a way to inexpensively add WiFi to the Pi. 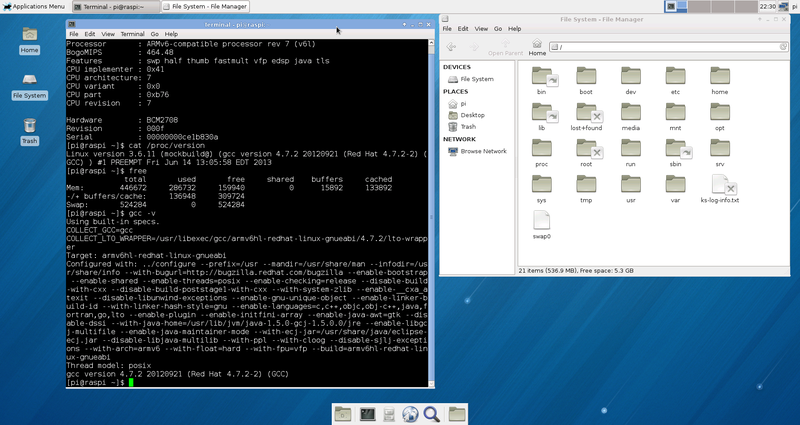 The graphical desktop for Raspian is Xfce, a simple environment that has been a refuge for many fleeing Gnome 3. Xfce proved to be absolutely no problem. If you’re used to Gnome 2 in any incarnation, then Xfce is dead simple to operate. Besides, give me a shell to work in and I don’t really care what the visual desktop looks like. A quick check of resources shows it has GCC 4.7.2, Python 2.7, and a late version of Ruby. Although I couldn’t start irb up because not all the Ruby Gems were installed. 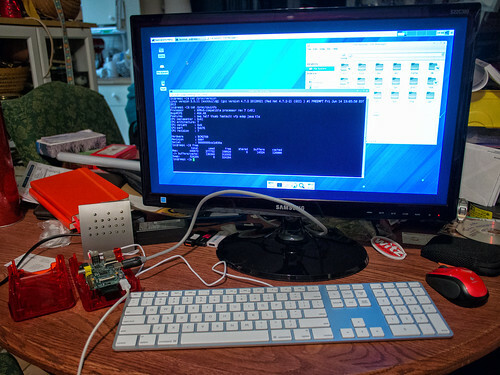 Working with Raspian on the Raspberry Pi demands patience. It’s slow. Even my Linux VMs on my Windows 8.1 are faster and smoother than the Pi. And yet one must always remember that the Raspberry Pi is, after all, a $35 bare-bones computer running a mid-to-low-end ARM processor (ARM1176JZFS running at 700MHz) with 512MB of RAM. Although, come to think about it, my AMD 32-bit PC from 2003 was only a little bit faster, ran Microsoft Millennium (ME) on 512MB of DRAM. I suspect that if I were to install the current release of Raspian it might run a bit smoother than it does right now. Still, it’s a bit remarkable to see it running at all. I purchased this as an embedded system, not as some ground pounding workstation. For what I intend for the board it’ll be running in character mode to avoid consuming precious memory with a graphical desktop. For what I have in mind I think it’ll be just fine.